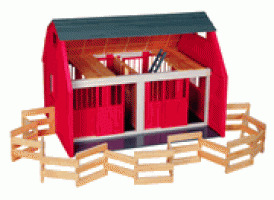 The Maxim Red Grande Stable is a sturdy stable with corral where favorite equestrian friends can be housed. This detailed barn is made more realistic with sliding stable doors. Combined with a corral that can open up to 90”, imagination can not help but be sparked! So let your children participate in creative play with their horses and accompanying stable. Ages 7+.